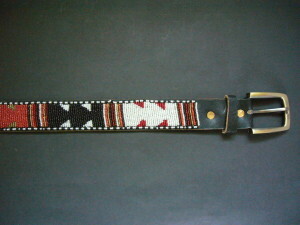 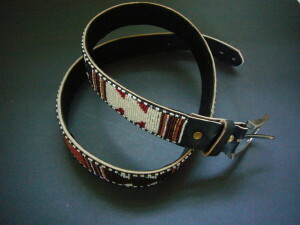 A high quality black leather belt with intricate woven multicolour bead design, leather backed and strong brass buckle. Adjusts to fit size 36"-41" waist/hips (over garment) - approx UK ladies size 14 /16 or mens medium - please check the measurement given before ordering. The belt is also 1.5" wide to fit through standard belt loops.